Our relaxed atmosphere and friendly staff will make you feel at home. The Three Compasses is a locally-owned restaurant, serving good quality locally-sourced food prepared fresh for your enjoyment. 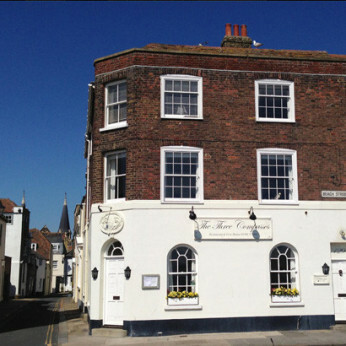 Three Compasses in Deal has accommodation. The pub has a beer garden, it has a car park. Three Compasses is a family friendly pub. The pub serves food, it has a function room that can be booked. Three Compasses has an outside area. The pub serves real ale, it has a real fire. We're really sorry but we don’t seem to have any offers or events for Three Compasses. We're sure there must be something happening here but they just haven't told us about it! Please do mention this to Three Compasses when you next visit them.